I visited two breweries in Quebec City while I was in town. La Barberie was the older of the two and has been around for over 10 years. Noctem is very young and yet still managed to impress me heavily. 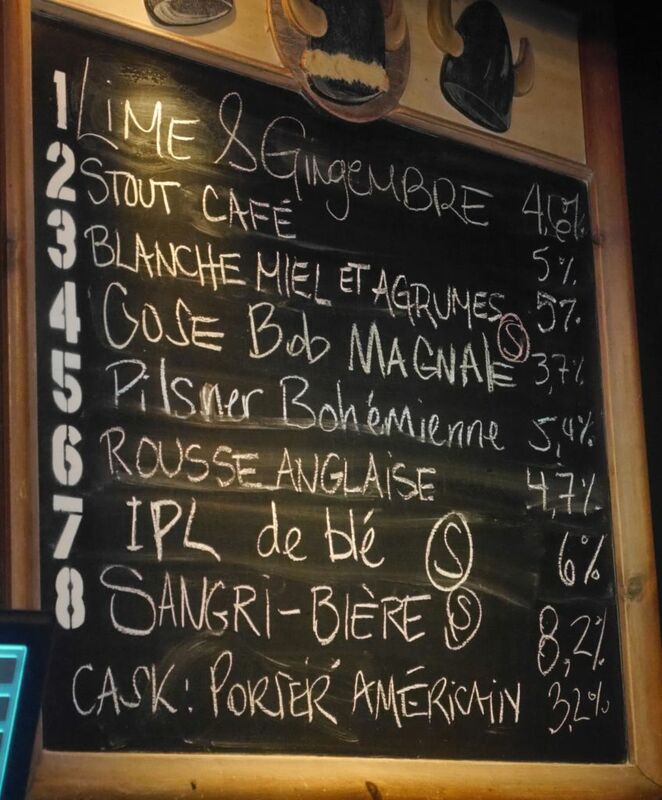 La Barberie is a small space that gets packed quickly with people either ordering flights or full pours of beers. It has a very traditdional feel to it and doesn’t get too loud. They had a large flight available of 8 beers which gave me a good mix of styles. The only disappointing thing for me was that their hoppy beers are very traditional and lack the modern flair that has become common in California and elsewhere. I started with a ginger and lime beer which was very tasty with a good mix of lime on the front and ginger on the back end very subtle. The coffee stout was delicious and smooth with tons of coffee flavor and very nutty. The Bier de Miel farmhouse ale was really tasty with a ton of lemon and spice and a mild sweet finish, a very tasty saison. The pilsner was quite earthy and chewy with a peppery finish, very nice. The English style red ale was quite bitter and fruity, pretty traditional and not my thing. The IPL was quite strongly bitter with lots of pine and floral hops and some earthy malt flavors. The gose was a little fruity and a little salty, silky smooth and not too tart. I wasn’t expecting something very sour but after they recommended I save this for last it made me expect something a bit more sour. The final beer is meant to be a sangria style beer and it was unlike anything I had tasted before. It had tons of raisin and grape notes from the malts and a sweet finish with hints of red wine. I would pass on that one in the future for other better beers. 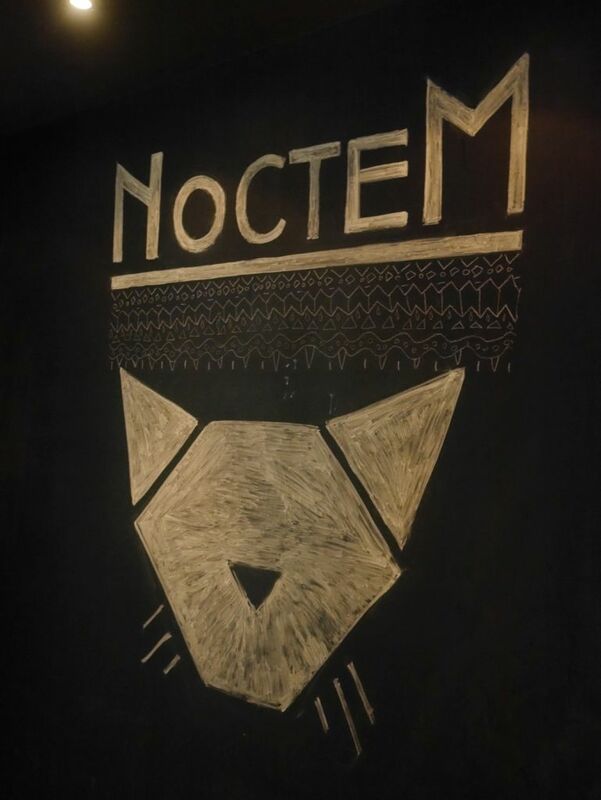 Unlike La Barberie, Noctem is a noisy bar atmosphere that I wasn’t interested in staying at very long. The beers I tried were very tasty but it was so loud that I didn’t stay after my four tasters. I tried the sour saison, which was fruity and mildly bitter with notes of grapefruit and lemon. The stout they had on was made with grapefruit and pepper, an unexpected combination that actually worked really well. The acidity from the grapefruit balanced nicely with the pepper and it was quite nice. Their house IPA was a delicious mix of pine and grapefruit with a strong bitter finish, very impressive. The apricot sour was delicious and smooth with tons of fruit character. I would have ordered more of it except for the music playing was so loud. 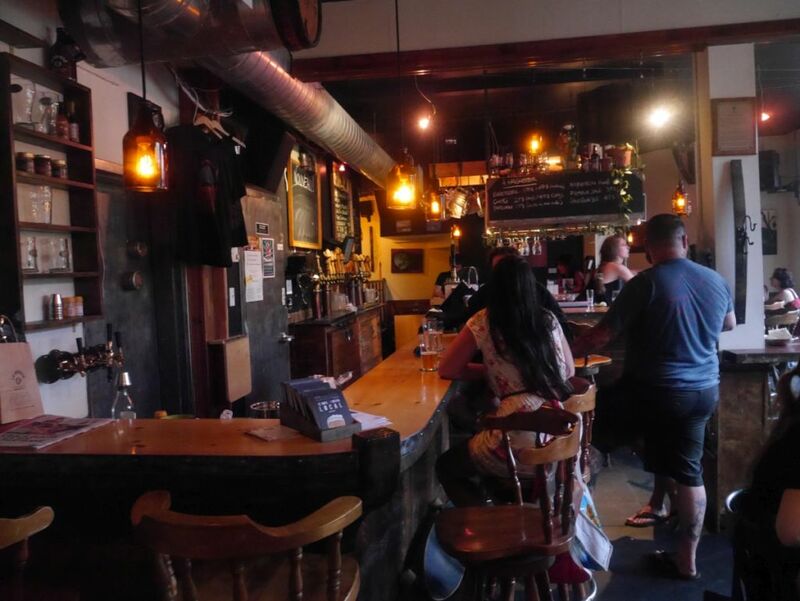 Though I had read some mixed reviews for Noctem prior to visiting I was quite impressed by their beers overall, though the atmosphere leaves a lot to be desired. 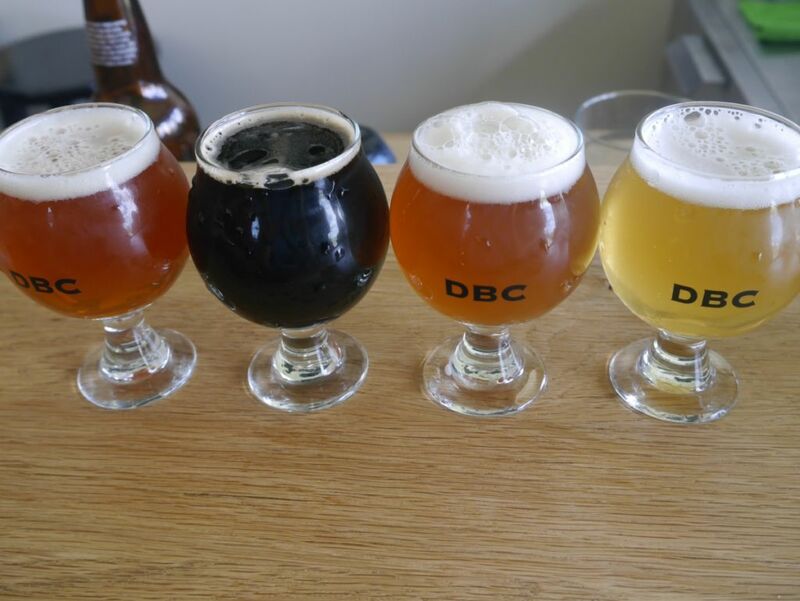 The breweries in the neighborhood of Ballard in Seattle have exploded recently such that they are close enough together that you can walk to a number of them after parking. For me this meant visiting Reuben’s Brews, Stoup, and Lucky Envelope in one monday afternoon. I wanted to visit Populux as well but they were closed that day. Each brewery had a few tasty beers but nothing to the level that would justify the hype behind them. 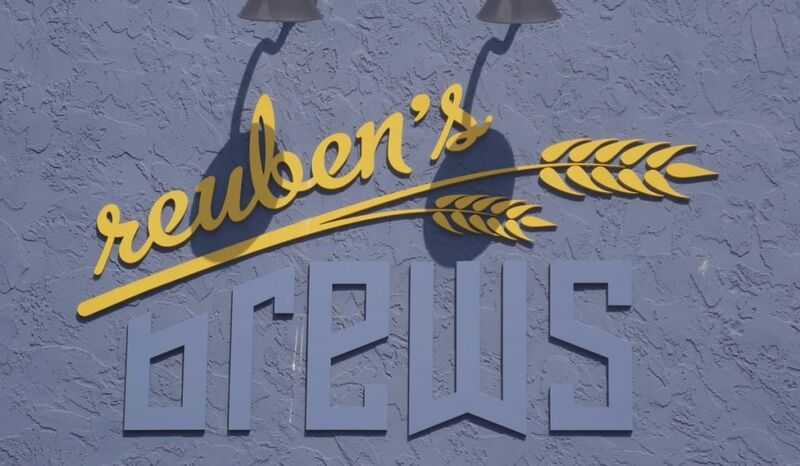 Reuben’s Brews is the first one I wanted to visit due to reading about it online from another blogger. 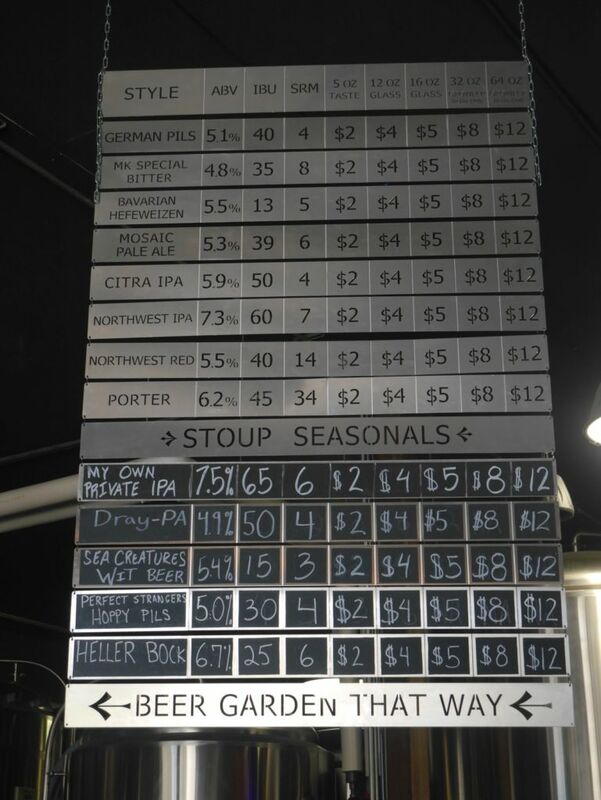 They had a massive tap list but the seven beers I ordered didn’t impress me enough to get me to order another flight. I tried three sours, three IPAs and one stout. The three sours were all very interesting though my favorite was the Kentucky Common. It was really smooth with notes of caramel and some mild tartness. It had a delightful smooth finish that I don’t get much. My sister really liked the dry-hopped sour because it exhibits tons of lemon with a mild tart kick. I also enjoyed the fruited sour I had because I thought it had some good balance, just the right amount of fruit, and a good tart finish. I picked my IPAs to try by the two varieties they had available in cans. Both seemed to exhibit bitterness over aroma and both also seemed to have a wheat malt base that I didn’t really care for. Though one of them had some nice tropical fruit and pine after it warmed up, it was just fairly average. The experimental IPA was really off-putting and the flavors reminded me of Sorachi Ace hops. Neither one of us liked that one at all. I later told the bartender they should put a note that it tastes similar to Sorachi ace because that hop is very polarizing. The Porter was really tasty with lots of caramel, roast, and mild smoke. 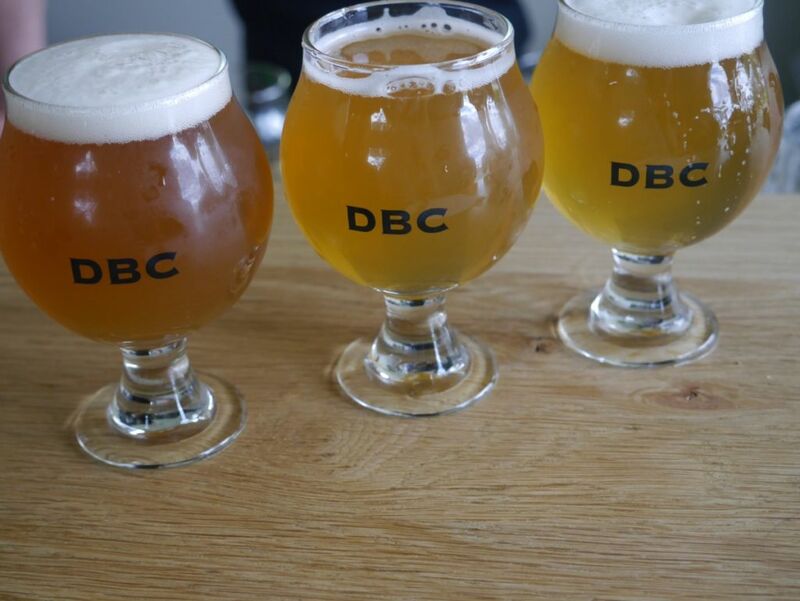 For such a new brewery, I was surprised that they had almost 20 beers on tap. It seemed to me like they need to spend more time coming up with some killer core beers but I hear their IPAs are quite popular around the area. If you like kettle sours, it should be an interesting place to stop by but I wouldn’t recommend trying everything on the board. They have a nice open atmosphere and tons of outdoor seating and street parking. 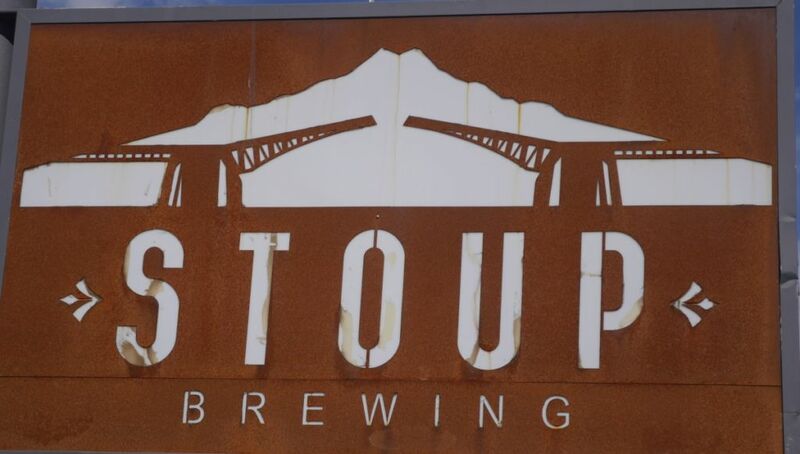 Just a short walk from Rueuben’s is Stoup, where they have a shorter tap list and the IPAs are more flavorful. I did not care for the ESB I tried. It was really pretty tasteless and thin. Their seasonal witbeer was pretty good with lots of spice, some mild fruit, and hints of lime. The Mosaic Pale was quite popular there and my sister really liked it. I thought it was well done and had a good amount of citrus and fruits. It also had some notes of green peppers, which was a bit strange. I preferred the Citra IPA instead, which had a lot of tropical fruit notes. The North West IPA was an interesting take on the style, lots of sticky, dank pine character that dominated over the malts. The porter was solid but lacked the sweetness that I enjoyed in the one at Reuben’s. Stoup seems to have a good start on finding the right flavors for their IPAs but the hops weren’t bursting as much as they could have been. They also have a nice open ambience and a good amount of outdoor seating. 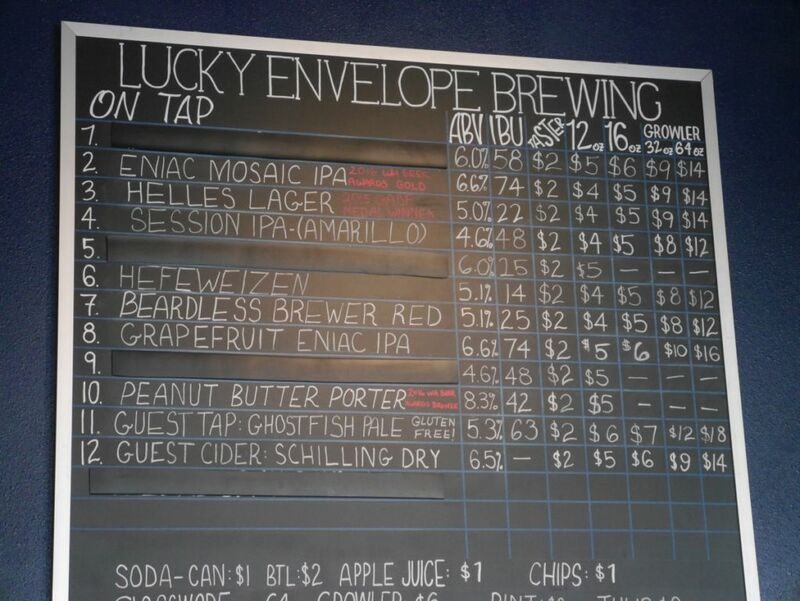 I started with a helles at Lucky Envelope and really liked the fruity apricot hop character and crisp helles taste. The Session IPA was smooth and fruity, and done well. The IPA was nice and fruity without a ton of bitterness and exhibited lots of tropical fruit. The grapefruit version was quite tasty, with a bitterness to the beer that suggested lots of zest was added to the beer. Their Peanut Butter Stout was also quite delicious with tons of nutty flavor and a smooth finish without being too sweet. Known for lagers and wild ales (lagers?) Holy Mountain has developed quite a reputation very quickly. Many of their bottle releases sell out incredibly fast. Thankfully they have plenty of other good beers available for those who happen to stop by without planning like myself. I won’t bother describing the specific style of most of the beers since they are almost all wild. Though they didn’t offer tasters, we were able to do half pours of everything and create a flight still. I also left with a few bottles to go. I started with Kiln & Cone their pale ale, which was really smooth and quite fruity. After everything else we tried their Three Fates lager, which we should have started with as well. It was quite tasty lager with an earthy back and some floral hops. Ceremony has the unique flavor of cake frosting and coconut while finishing with some mild funk. My sister liked it more than I did but it was interesting for sure. Demon Teller was a nice mix of brett and funk with some mild tart and a nice dry finish. Fellowcraft was a bit more fruity than the demon teller and had some nice grapefruit notes. Witchfinder was hoppy and mineral forward, solidly fruity, and good and funky. I got a bottle of this one. Most of the brett beers were tasty though none of them stuck out either as really bad or clearly the best. They are a bit isolated as far as breweries go and my sister tells me not very easy to get to by public transit. If you want anything special, follow their social media for the extremely limited releases. 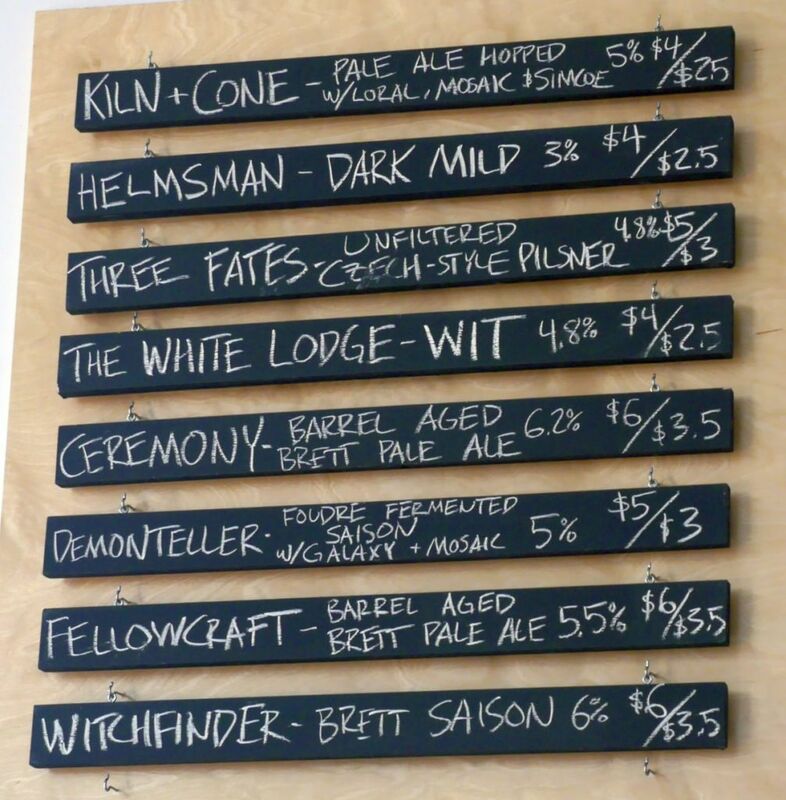 Overall, I would highly recommend Holy Mountain but the three other breweries didn’t knock off Fremont Brewing or Bellvue Brewing from my previous favorites from an earlier trip. I only visited two breweries in my time up in Calgary because the more interesting part of Calgary is the nearby Banff National Park where there are two small breweries, one in Canmore and one in Banff that I’m sure are great compared to the macro beer you can find in most of the convenience stores but also nothing exceptional. 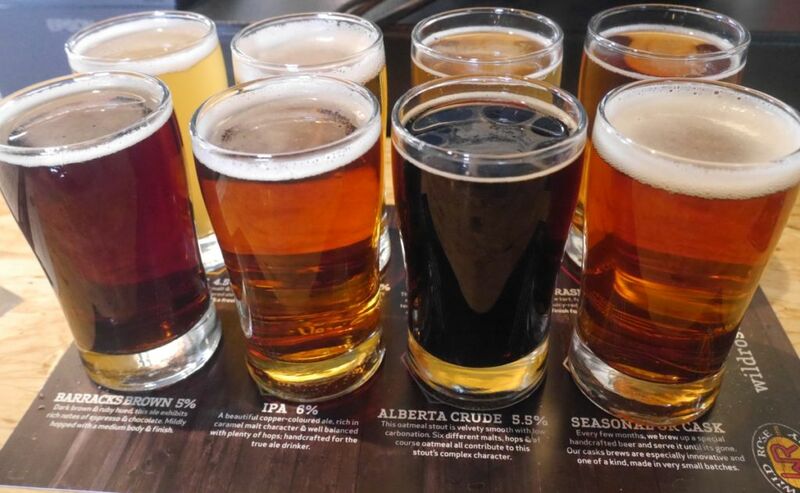 Out of the two breweries I did visit in Calgary, one was fairly disappointing and the other was exceptional and quite impressive. 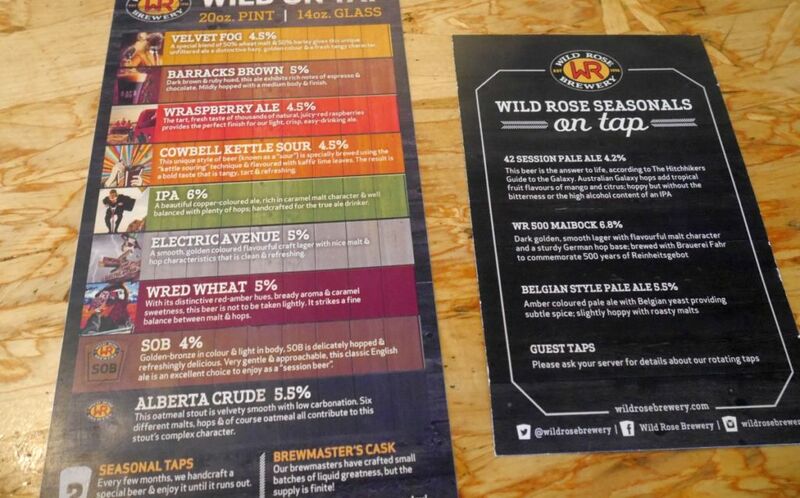 WIld Rose Brewing is a larger brewery and sounded like they had some interesting beers but I finished about half of the total tasters because some were not for me. 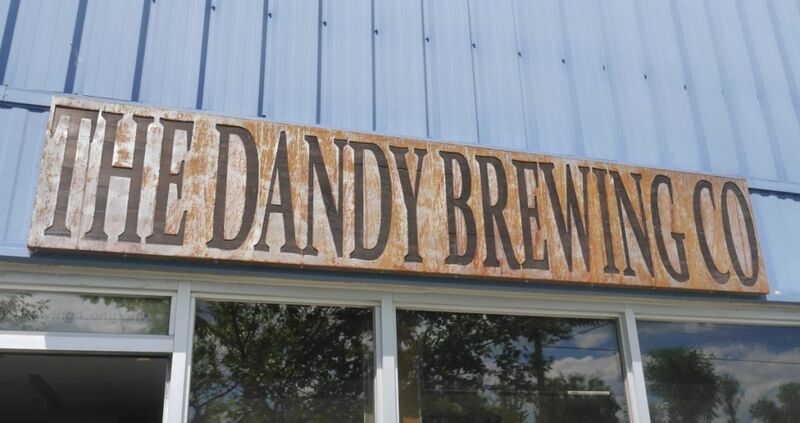 The smaller brewery, The Dandy Brewing, was excellent almost across the board and set my bar so high that when I went to breweries in Seattle the following day, some of the hyped breweries, while solid, didn’t live up to the same standards. 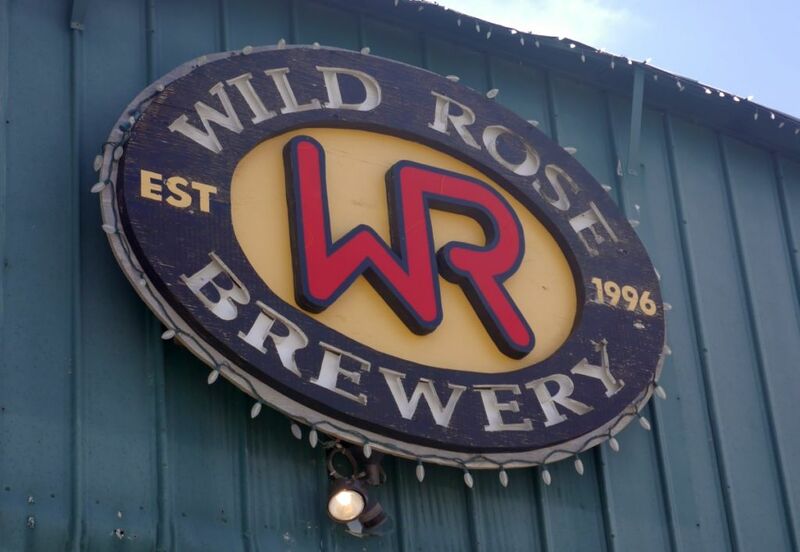 At Wild Rose I tried 8 tasters. Of those, half were tasty. The Velvet Fog was a really tasty beer of half wheat and half pilsner malt that was crisp and delicious with lots of nice notes of spice and citrus while keeping everything very balanced. This was one of the best beers of the bunch and I expect it is quite popular. The Electric Avenue was a fairly standard lager with some floral hop notes. Cowbell Kettle Sour is a tasty light alcohol sour with lots of fruit, citrus, and lime, with a strong tart finish. The lime comes on strong from the use of lime leaves. The Wraspberry ale was not very tasty at all and while it had some smooth raspberry flavor it also often tasted like cough syrup. It might be better mixed together with the kettle sour. The Barracks Brown was also not really my thing. Brown ales in general tend to be lacking in flavor and this one was also strongly smoky. The IPA was fairly standard old-school bitter-forward IPA with a strong malt backbone. As it warmed up it exhibited some solid darnk and resinous qualities. Alberta Crude was a solid porter with a good amount of roast and some bitter chocolate. The Maibock was way too sticky sweet, exhibited notes of over ripe fruit and rasins and was quite boozy in the finish. I did not drink much of this. 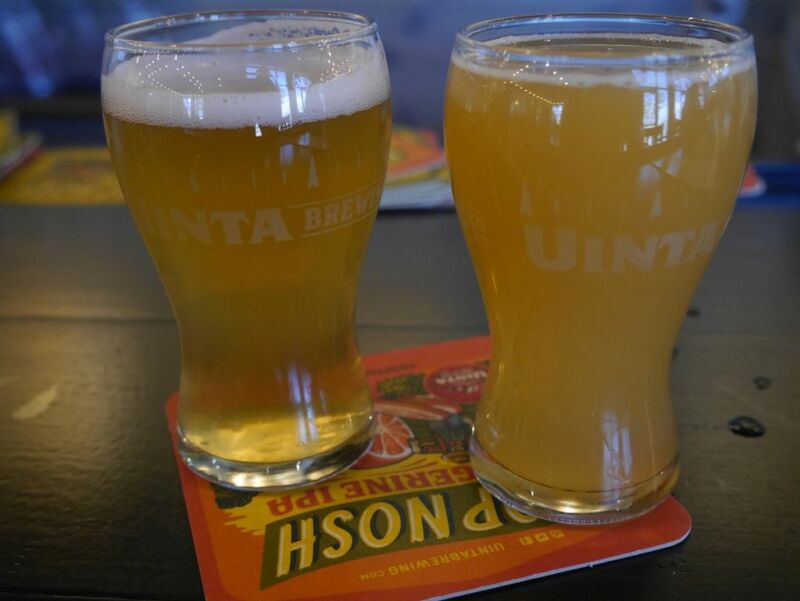 The other two seasonal beers, the Session Pale and Belgian Pale were both tasty versions of the style. The Session Pale has some solid galaxy hop flavors and the Belgian Pale exhibits lots of spice notes from the Belgian Yeast. 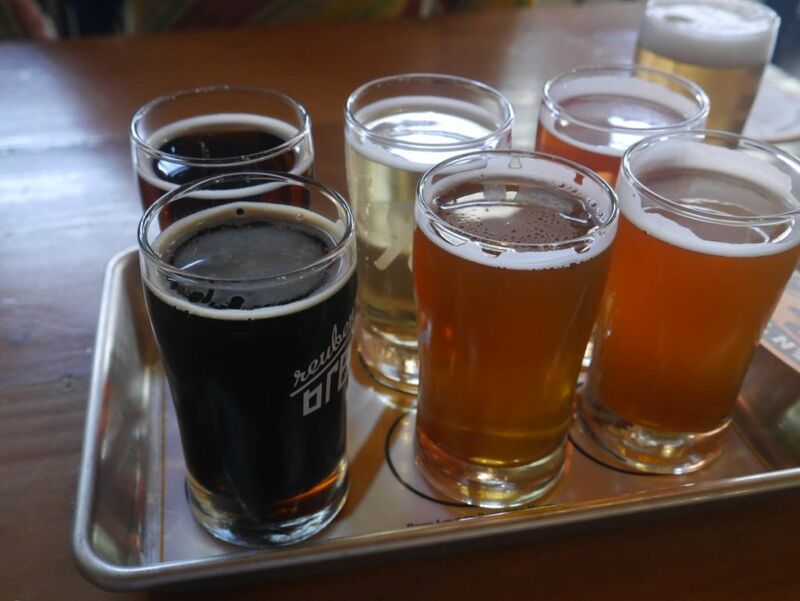 While about half of the beers were disappointing, the highlights were nicely done and would be worth a stop to try the highlights listed below if you are in the area and need some tasty beers. The Velvet Fog would be perfect to fill in a growler for you to take with you out into the mountains. 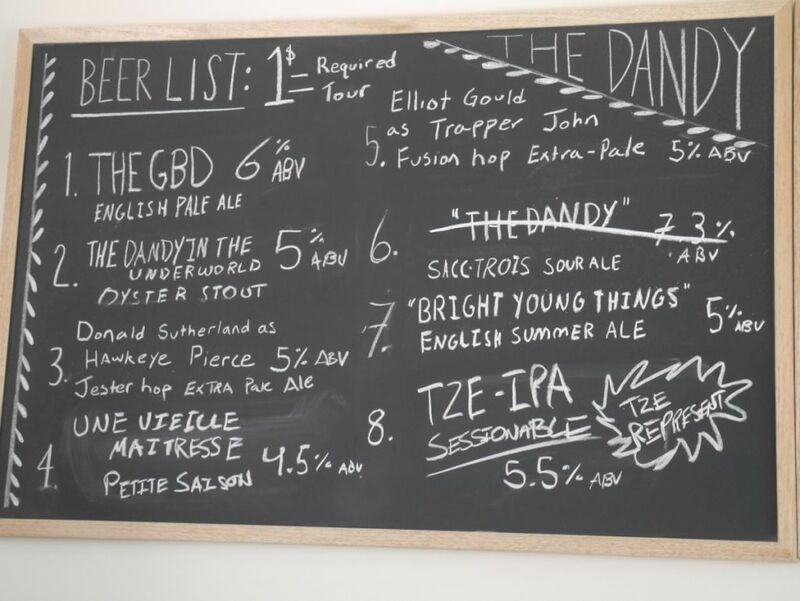 More recently I have been a much bigger fan of small breweries and The Dandy was a good example of why. Though they seem to have already out grown their fairly small tasting room, the wait wasn’t terrible and the beers were delicious. I tried a taster of everything they had available and had a pint of my favorite after I finished because it was so tasty. I also enjoyed meeting with a number of locals at the bar and hearing about their experiences. The English Pale was the most juicy English style ale I have ever had and was super fruity with tons of apricot from the hops and some smooth caramel malts at the back. My husband even liked this one and he rarely likes anything besides stouts. The Oyster Stout was smooth with a nice mix of caramel and roast, a solid stout, though not as complex as the Alberta Crude at Wild Rose. The Hawkeye Pierce single hop pale was super juicy and not bitter with notes of grapefruit and melon. This and the English Pale were favorites for me and many of the other people around as well. The saison was nice and earthy with fruity notes and tons of flavor for the low alcohol. The Fusion Extra Pale was nice with floral hops that balanced nicely with peach and melon. The English Summer Ale is an interesting companion to the English Pale, really smooth with notes of floral hops and hints of peach. The TZE IPA was the most bitter of the bunch but had some light citrus kick to it. It is a solid IPA as well. Everything at The Dandy was tasty with the highlights below that were extra impressive. They clearly have learned the modern way of making delicious juicy hoppy beers and just to make clean flavorful beers. I’m excited to see what they come up with in the future and I can see they will make some great things. I make a point of going to breweries on my trips directly rather than going to bars. 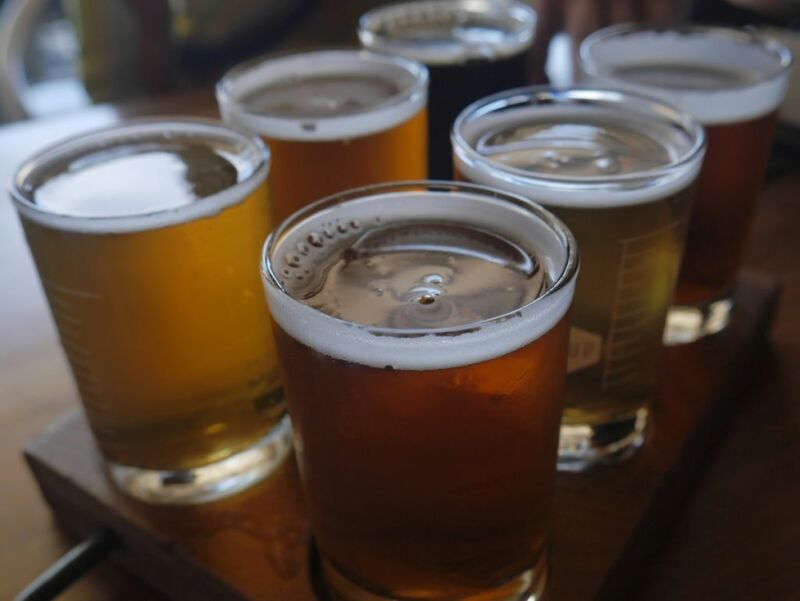 Utah has a few restrictive laws that limit the alcohol content of beers they can serve on tap. Any beer on tap must be less than 4% alcohol and anything higher than that must be served in bottles. 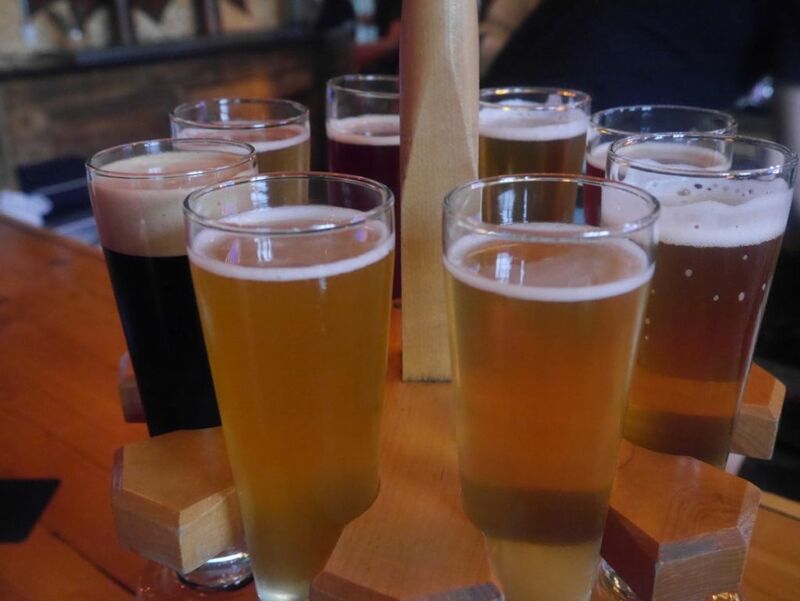 This severely limits the ability of breweries to do taster flights because most breweries aren’t going to want to pour taster size pours from a bottle. Though certain breweries I have visited in other states choose to do that they may be limited from the option in Utah as well. 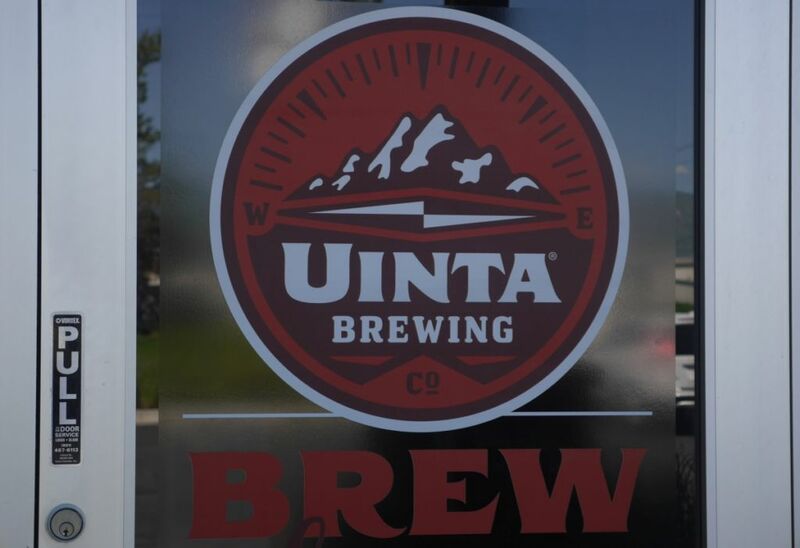 The two breweries I visited were Epic and Uinta. 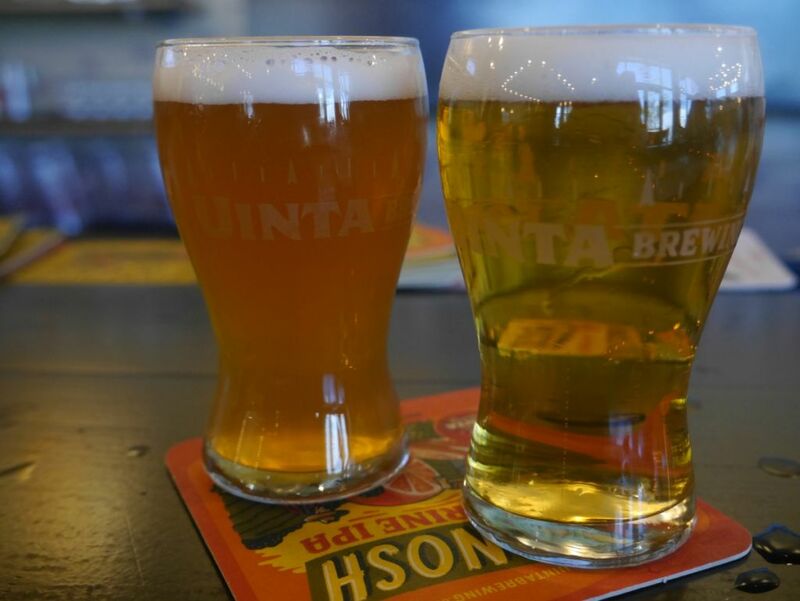 Uinta has a fairly large number of beers on tap despite the 4% alcohol restriction. I tried five of these and then ordered a bottle of the IPA because I couldn’t taste it on tap. The Gose was crisp and mildly tart with some light citrus notes and a light salty finish. I enjoyed the gose quite a bit. They also had a fruited version called Flamingose with pineapple added, which made the beer more cloudy with a darker yellow color. The beer was nice and fruity and had grapefruit notes and a bitter finish. The Baba black lager was smooth and light body with a mix of mild smoke and roast. I have had better black lagers but this one was not bad considering the alcohol restriction. The Session IPA was smooth and crisp with mild citrus notes and not overly bitter. I liked it better than the Wyld Extra Pale which while smooth and balanced had a bit more malt forward character and was overall too mellow. 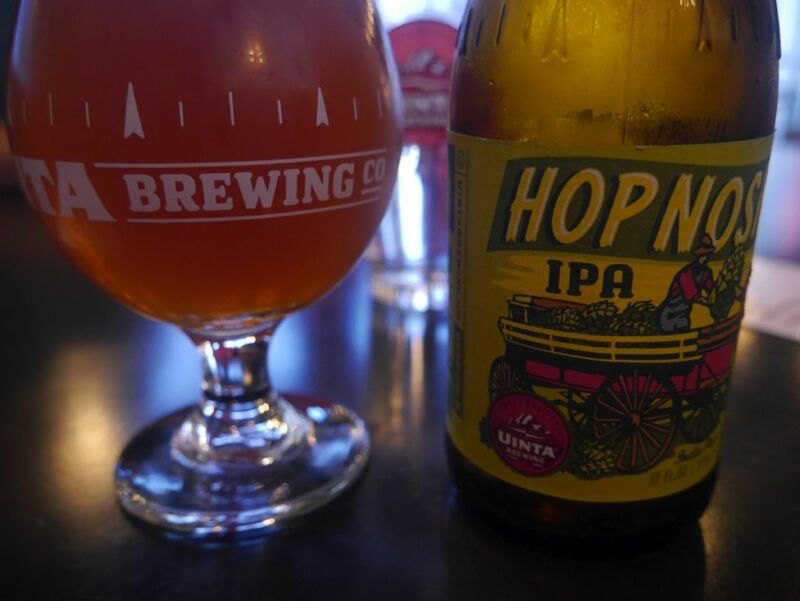 Hop Nosh IPA makes its way down to San Diego regularly but I wanted to try it fresh from the source, even if that meant in a bottle. The IPA was super smooth and nicely balanced with a solid malt backbone without being a malt bomb. 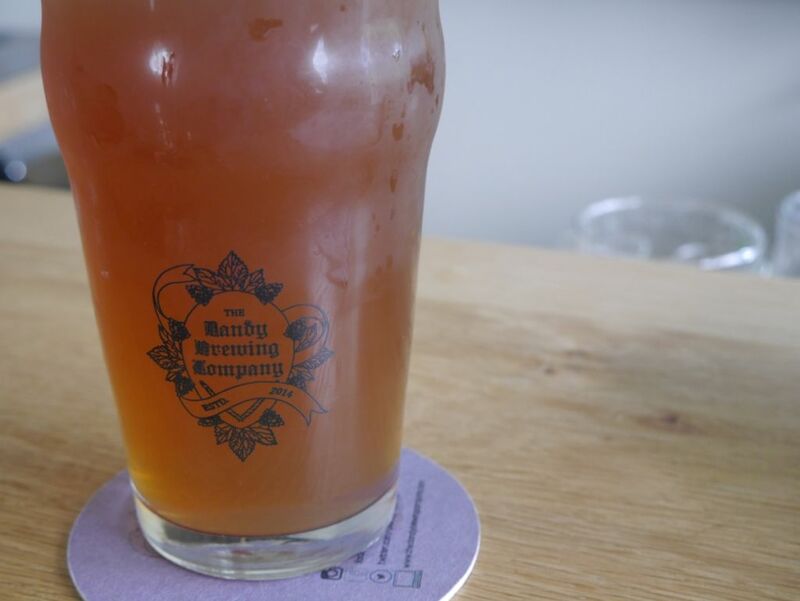 The beer had good dank hop character and hints of juice and citrus. I didn’t try the double IPA or the other stronger offerings because ordering 12 ounces of each would be quite a bit much. I didn’t do any sort of tasting at Epic because I was more interested in their higher alcohol stouts. Though we did end up buying two bottles, one of the Oatmeal Stout, and one of the Imperial Stout, to enjoy in our hotel room. We also later shared a bottle of Big Bad Baptist at the Annex restaurant Epic has in Salt Lake City and later that evening opened a bottle of the Son of a Baptist at home since Epic beers make their way to San Diego as well. The oatmeal stout was super smooth and delicious and scary easy to drink quickly. It had notes of marshmallows and a mild roast with a really velvety background. I found the imperial stout to be a bit too molasses forward. It had some hints of chocolate and roast under it but the molasses was overwhelming and killed it for me. The Son of a Baptist is a smooth and light bodied delicious coffee and chocolate stout that features coffee prominently with some mild bitter chocolate under it. In comparison to this, the Big Bad Baptist, aged in Bourbon Barrels was thick and sweet yet balanced perfectly without bourbon dominating too strong. Coffee and chocolate notes were both much more subdued here giving it a delicious balance. Of the four i would soonest search out the oatmeal stout and the big bad baptist for future consumption. They are both delicious well-crafted beers. 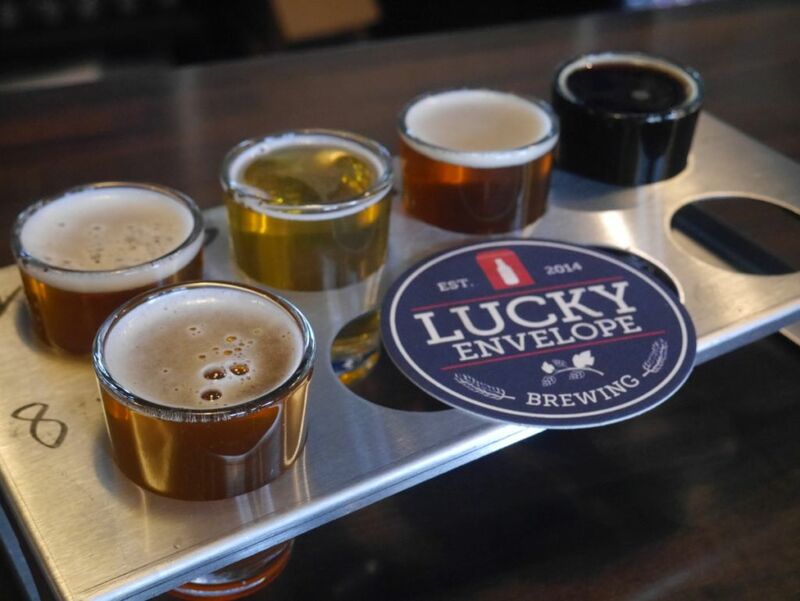 While the two breweries listed aren’t the only ones you can visit in Salt Lake City, they are the two most prominent. If you do plan to visit either of them it might make the most sense to bring a bottle or two to your hotel room rather than drinking at the brewery because there is a fairly high markup to drink the big bad baptist at the brewery rather than taking the bottle to go. Though the brewery experience was not ideal it was a great companion to the hiking I did in the area that was quite gorgeous.